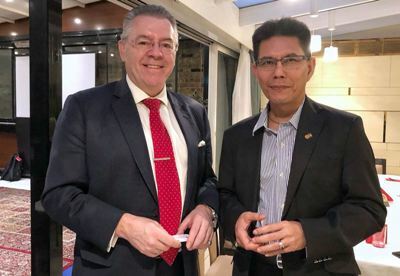 David Stringer-Lamarre, MD of FortisCL and Executive Committee Member of the British Malaysian Society was pleased to meet with an aviation delegation from Malaysia visiting the UK with respect to the Farnborough Air Show. This was arranged by the Malaysian External Trade Development Corporation (MATRADE). David said that it was interesting to hear about Malaysia’s growing aviation sectors and its engagement with large and SME companies from the UK. Delegates from Malaysia and British based attendees exchanged information over a traditional Malaysian dinner.